Since the happy night of October 21, 1907, The Merry Widow has been a classic of the American musical theater. The world premiere, at the Theatre-an-der-Wien in Vienna on December 30, 1905, had captivated that city, and Berlin and London soon thereafter capitulated. But in America, curiously enough, operetta in the Viennese style was not especially popular. Again and again producers offered sumptuous productions of works by Strauss, Millocker, and others, and sadly withdrew them when the public failed to respond. As Cecil Smith has pointed out, the perceptive Henry Savage waited some time before daring an American production of The Merry Widow, enviously watching its enormous success on the continent. And after two years he took a chance. It was a well-favored chance, and since 1907 The Merry Widow has had no further neglect. Of all the Sonias and Danilos to sweep around the famous ballroom, Ethel Jackson and Donald Brian are the most famous, since it was they who first sang “I Love You So” in this country. The production initially ran for fifty-two weeks, a remarkable record at the time, and dozens of companies sprang up to spread the enduring charm of Lehár’s music across the country. They have been followed by a succession of notable artists, including Marta Eggerth and Jan Kiepura (this husband-and wife team performed The Merry Widow over 2,000 times), Jeanette MacDonald and Maurice Chevalier, Mae Murray and John Gilbert (on the silent screen), and scores of others. In all its manifestations, The Merry Widow has possessed a glamour not quite approached by any other operetta, and a sort of innocent sophistication that is as fresh as ever, with a matchless mingling of Paris and Vienna when the century was new. The plot is as gay and inconsequential as comic opera can provide; the music is as gay and substantial as anything in the literature of the operetta stage. “Vilia,” “Maxim’s,” “Women,” “The Cavalier” – these are as enchanting today as they were in 1907, perhaps with their authentic flavor of Hapsburg Vienna even more so. But most important is the celebrated “Merry Widow Waltz: I Love You So.” Incomparably romantic, it amounts to an apotheosis of all operetta waltzes, and has been carefully (and in most cases ineptly) imitated ever since. Not even Lehár himself again approached so lovely a combination of atmosphere and melody, even in such successes as The Count of Luxembourg or Gypsy Love. The Merry Widow, in addition to being the first of the Viennese comic operas to enjoy American favor, has another distinction: it had a duplicate production in Chicago on the same night it opened in New York. This company was headed by Lina Abarbanell, who later replaced Miss Jackson in New York, and George Damarel. From these two companies grew the others that swept through the country and quite literally opened up a “Merry Widow” craze. As in later days, the high fashion demonstrated by the stars was adapted for everyday use, and Merry Widow hats and gowns, Merry Widow scents and cosmetics, even a rather daring Merry Widow coiffure, all these appeared. Theatrically inclined young gentlemen kept copious scrapbooks of clippings about Miss Jackson and Miss Abarbanell; young ladies equally idolized Mr. Brian and Mr. Damarel. 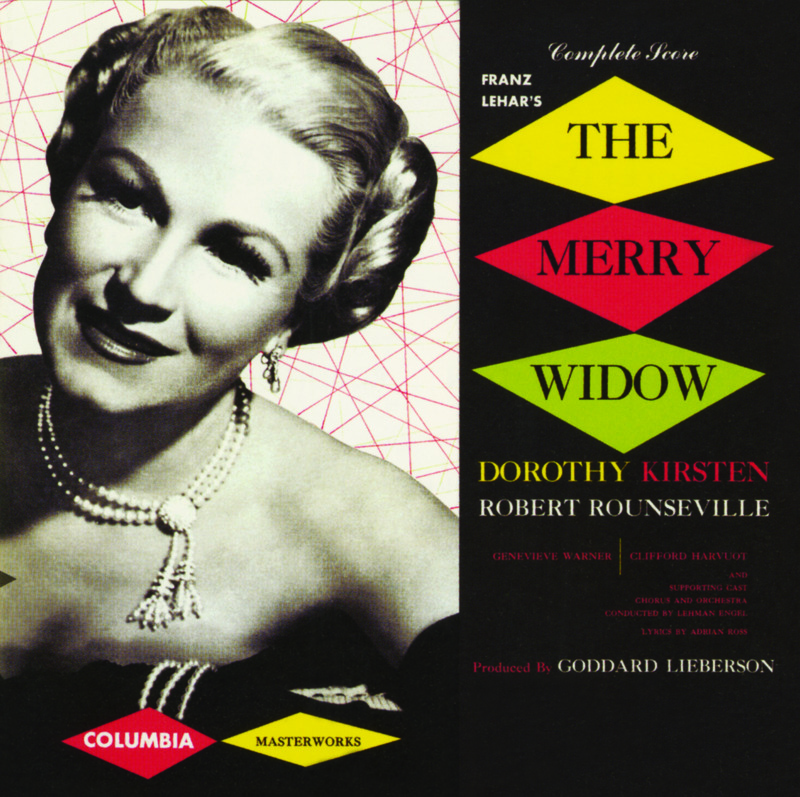 In this bubbling record presentation of The Merry Widow, produced by Goddard Lieberson, special effort has been made to capture the light-hearted gaiety of the original production. Orchestral arrangements made for that fabulous opening have been retained, settings first heard at the New Amsterdam Theater in New York nearly fifty years ago. Moreover, a cast of distinguished singing actors has been assembled, headed by Dorothy Kirsten of the Metropolitan Opera Association and Robert Rounseville of the New York City Opera Company. Such other fine singers as Genevieve Warner and Clifford Harvuot, also of the Metropolitan, and Wesley Dalton, contribute their talents to this sparkling evocation of a joyous past. In brief, The Merry Widow recounts the adventures of Sonia and Prince Danilo, who were once sweethearts, but quarreled. Years later, when Sonia is a widow and Danilo a member of the Marsovian embassy to Paris, they meet again. He vows that she will not have another chance to jilt him, but Sonia, in true operetta fashion, thinks otherwise. A few measures of the celebrated waltz prove that she is right, and in the end they are reunited. The three acts take place at the Marsovian Embassy in Paris, at Sonia’s residence near the city, and finally at Maxim’s restaurant. Present-day listeners may be surprised at the relative brevity of the famous waltz in these original orchestral settings, but it should be recalled that it was detailed to accompany stage action, as Sonia lured the Prince into a romantic situation. Alone on the stage, they pantomime their reawakening attraction, swaying slightly to the music, resisting and then giving in to the intoxicating music and joyously waltzing out of sight. Since its world premiere in 1907, The Merry Widow has been staged many times and enjoyed by millions of people. Of all the extant recordings, one of the most vibrant was produced by Goddard Lieberson and music director Lehman Engel in 1952 as part of their efforts to salvage stage works that had not been recorded previously. Starring Dorothy Kirsten and Robert Rounseville, it enabled record buyers and fans to enjoy all over again the sumptuous melodies created by the gifted Viennese composer Franz Lehár to underscore the romantic love affair between Sonia, the merry widow of the title, and Prince Danilo. They had been sweethearts in their youth, and their passion for each other is rekindled when they meet in Paris years later. The music and the performances bubble like champagne, making this recording as delightful today as it was when it was originally produced.